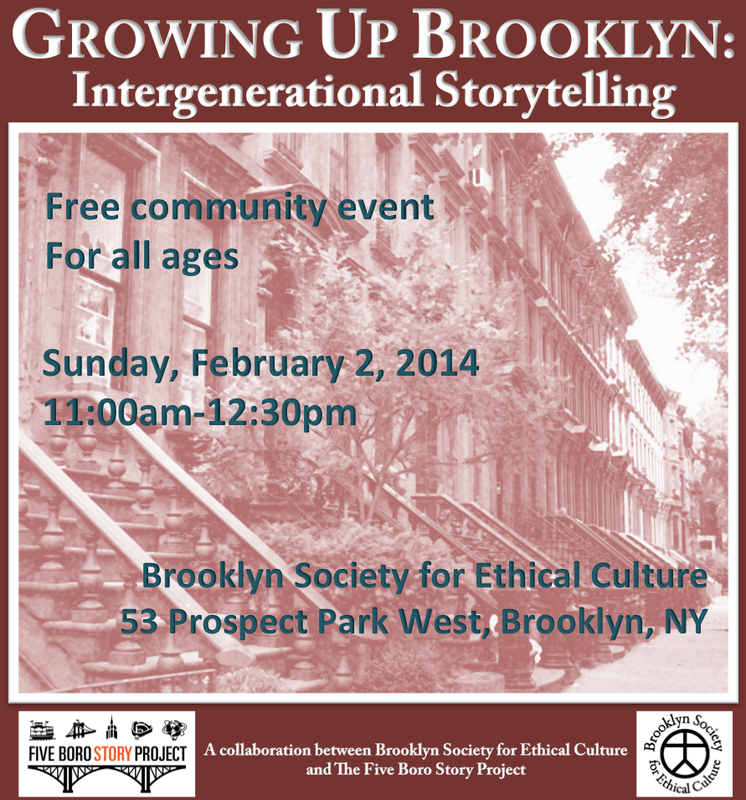 On Sunday, February 2nd, the Five Boro Story Project joins Brooklyn Society for Ethical Culture’s Sunday Platform series with “Growing Up Brooklyn,” an intergenerational storytelling event. How are we shaped by where we grow up? What does it mean to grow up a Brooklynite? Hear true tales from master storytellers Barbara Aliprantis and Bobby Sutton about the block, neighbors, stoops, and streets of their Brooklyn childhoods. Afterward, share your own neighborhood stories. For people of all ages and all neighborhoods. Barbara Aliprantis, an award-winning Greek-American Storyteller from Flatbush, is nationally known for performing and producing events in voice and/or sign language on television, in theaters, schools, libraries, community centers, and festivals. Bobby Sutton is a playwright, actor, copywriter and creative director from Crown Heights who now lives in Brooklyn Hieghts with his wife Elizabeth K. Davis and their two cats, Mookie Wilson Moskowitz and Daisy Mae Rumplemeyer. Brooklyn Society for Ethical Culture is located at 53 Prospect Park West, Brooklyn, NY, 11215. For directions CLICK HERE.